Sunday 18 December. Meeting at Chichester Cross. Sunday 18th December. Walberton Pond start. Tinsel ride to the Winterton Arms, Crocker Hill. 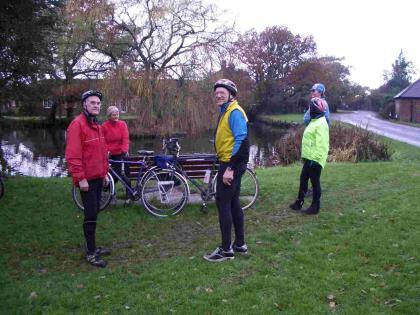 This ride was led by Harvey who was joined at the Pond by Phil and Mary, Alan and Liz, Gill, Mike and newcomer Emily. Eric, Adrian and Chris went direct to the Pub making 11 in all. Another 11 arrived at the Pub from the Chichester Cross start making a total of 22 out on the day. Weather was very cold. Overnight it was -6C and about 0C at the Ride start rising later to the dizzy heights of +6C. However no ice was encountered and it was a beautifully clear blue sky. 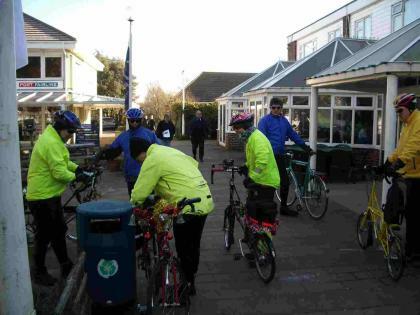 Harvey led the group to Aldingbourne Country Centre Cafe for elevenses. Then a loop was taken on byroads via Eartham to Crocker Hill for lunch at the Winterton Arms. Arthur brought in the Chichester Group to help with the total takeover of the Bar seating. 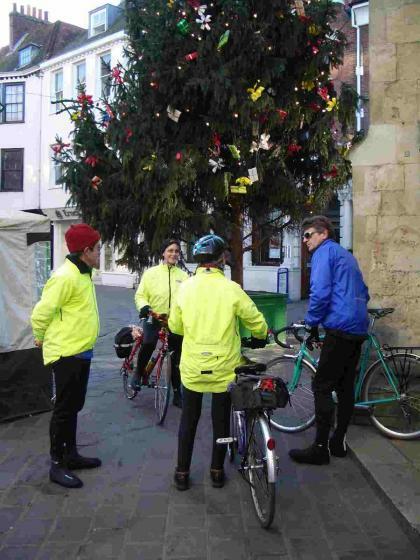 Edwin judged the bikes awarding the prize of a pack of Mince Pies for best decorated Bike to Lynn. In the afternoon some made their way back direct but 17 rode as a combination of the 2 groups on backroads round to Goodwood Park and then the Goodwood Airfield Cafe for Tea. 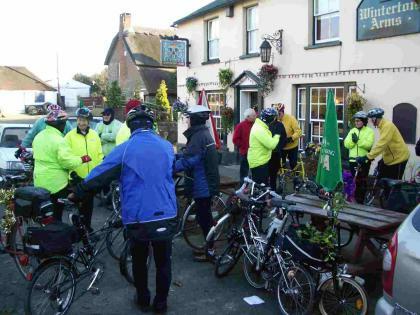 Sunday 18 December, Both groups about to leave the Winterton Arms. 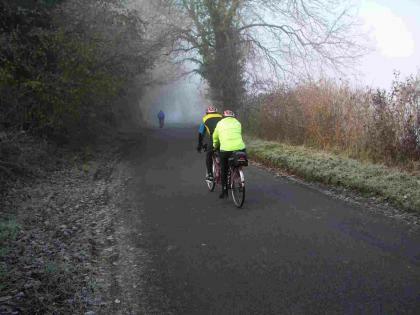 Sunday 11 December, 8.00 am Chichester Cross, Appetite Improver Ride to Manor Garden Centre, Runcton. Edwin led this ride and was joined by Phil and Mary and Sam. The weather was a day of extremes with bright sunny skies near the coast changing to thick fog and frost over the downs. The difference was very noticeable coming back with temperatures changing from 0C on the north side of Duncton Hill to 8C in the sunshine on the south side. With worries about early ice the outward route kept to gritted roads as much as possible heading up the B road to the Trundle and then along the ridge. At this stage there were still clear blue skies with the sun lighting up the occasional mist patch. The ridge road had not been gritted and was covered with a white layer of frost marred by only a few car tracks. There were great views down towards the coast with mist patches lit by the low sun. 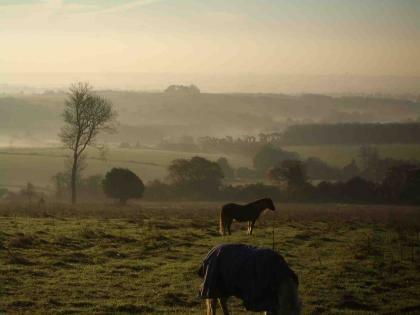 The East Dean Valley was buried in a thick fog layer with the sunlit hills rising above it. We descended down the main Petworth Road into the fog and the icy cold started to penetrate even my many layers protecting the extremities. (3 pairs of gloves. 2 socks and 2 overshoes) As we headed on to the top of Duncton Hill the road rose above the fog back into sunshine but the descent of Duncton soon brought us back into the fog. We continued to Petworth on the main road and arrived at Tiffins at 9.45. The cafe opened at 10.00 but the kind lady invited us in to warm up. We were joined by John Maxim and Brian and Sue from Arun Adur stopping off on the way to the Arun Adur Lunch stop at Wisborough Green. We returned on byroads to the base of Duncton hill and then up and over back into the sunshine. Then a direct route via Halnacker, Tangmere and Merston to lunch at Manor Garden Centre. With some coming direct and 16 on the short ride there were 28 at the Christmas Lunch. Sunday 11 December. Looking towards the coast from the Ridge. Sunday 11 December. 10.30 Chichester Cross start. 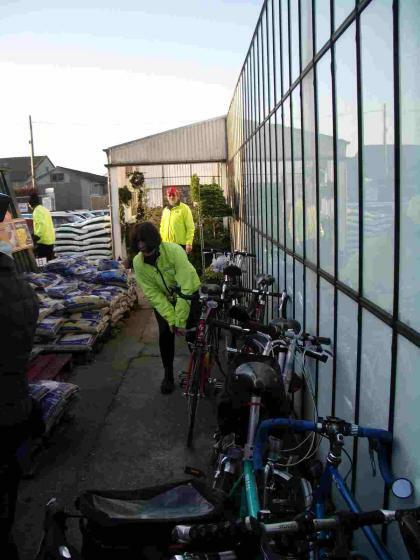 Ride to Manor Nurseries, Runcton. 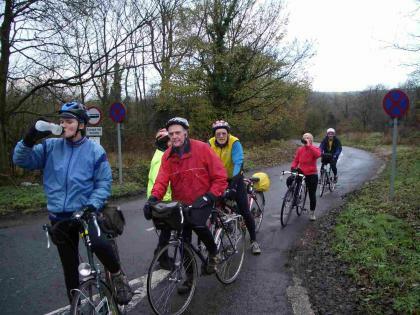 Alan led this ride to the Clubs Christmas Lunch and was joined by 15 other members. Weather was cold but sunny all day, later reaching 8C. The route took in Clay lane before turning south towards Bosham and a stop at Hilliers Garden Centre cafe on the main road for elevenses. The ride continued with a loop on byroads west of Bosham before returning to Chichester taking in cycle routes and then heading south to Runcton. With some members making their own way and also meeting up with the fast group at Runcton the total numbers attending the lunch was 28. 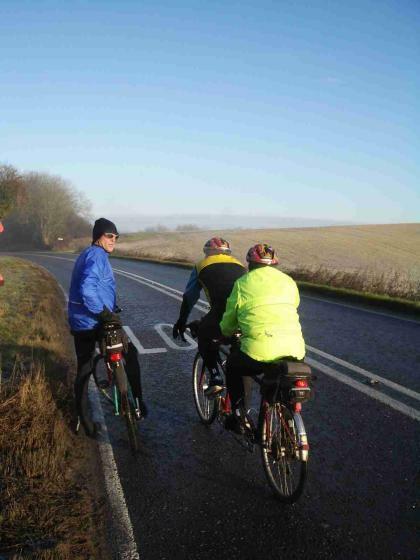 Sunday 4 December, Walberton Pond to the Rising Sun, Nutbourne. 7 of us met at Walberton Pond being myself (Edwin) Phil and Mary, Richard, Anne, Gill and Mike. Chris had a puncture en route to the start and met us at elevenses and Tom and Eric met us later at the Pub making 10 out on the day. The weather started cloudy but dry with tantalising glimpses of blue sky to the west and north. Temperatures got up to about 8C.We headed out via Madehurst and then a fast descent down Bury Hill to stop for elevenses at the Barn by the Willow Cafe, Bury, They were just bringing out signs saying “Closed, fully booked” which was due to a big lunch party but they kindly agreed to serve us coffees. 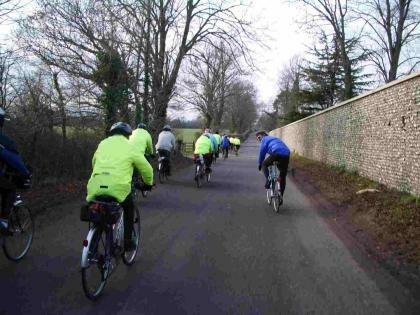 We continued on lanes round the back via Coates and then across to Coldwaltham. We crossed the Arun which was fill to overflowing due to the recent rains. We then continued past Wiggonholt and up to Nutbourne. At the Pub as well as Tom and Eric we met Brian and Sue and John Maxim from Arun Adur. After lunch the skies cleared to produce a bright but low Sun for the rest of the afternoon. 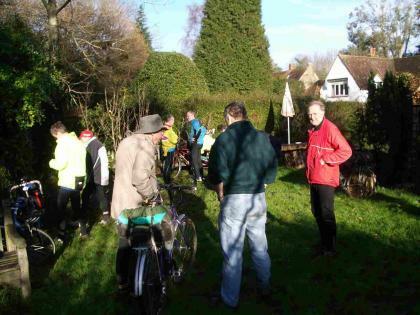 The return ride was the standard route via Amberley and Houghton Hill with a stop for tea at the outdoor cafe at Whiteways car park.